Every woman is A Gift From The Gods and deserves stylish accessories to easily sort out her travel plans. 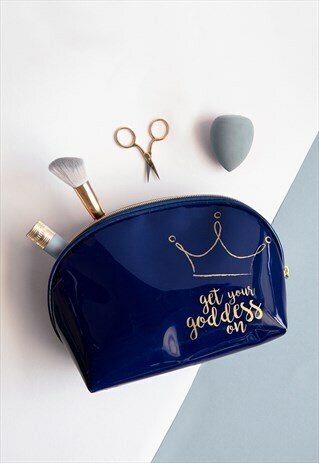 For the goddess who likes always wears her crown, this gorgeous navy travel washbag with gold crown design has bags of style to help you make light work of your packing needs. The size is ideal for keeping necessary items in one tidy spot. Keep a clear overview and use the bag to store: travel cosmetics, beauty products, deodorants, shampoo, powder, your toothbrush and toothpaste. Made of strong and durable PVC with a stylish gold zipper, prepare for hassle free travel with this easy to carry multi-purpose and reusable bag. Designed to be a thoughtful gift or personal treat for any goddess.